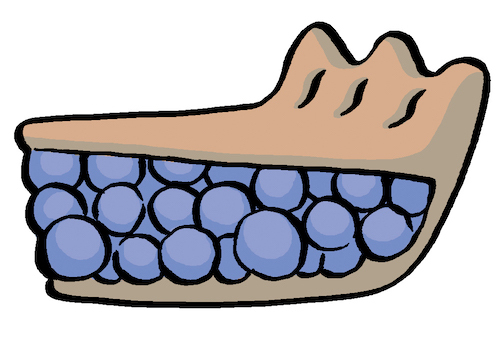 Ever notice a seemingly random piece of pie on the floor in one of my cartoons? Or an eyeball peeking out from behind something, a stick of lit dynamite under a chair, or a small one-eyed alien floating near the ceiling? These are the Bizarro Secret Symbols. Now that you’ve found the page explaining them, you can discover what they mean and how they can improve your life. The tiny number above my signature in each cartoon will tell you how many symbols I’ve placed in that cartoon. But keep all of this to yourself, or they won’t be secret anymore. 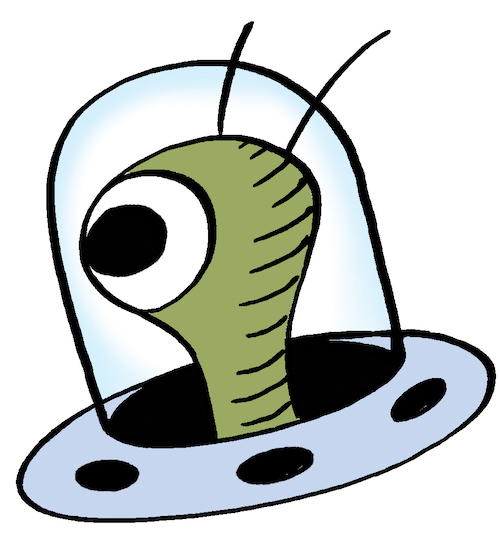 You need a Flying Saucer enamel pin. Here’s one. The UFO/alien is a symbol of the immense and immeasurable universe and all its possibilities. As anyone who has ever found themselves at the cold, steely end of an extraterrestrial’s medical examination can tell you, aliens are already here and living among us. They are benevolent creatures who wish to study us and learn what they can about our culture. Disguised as earthly creatures of all sorts, they watch us daily. You undoubtedly know many and do not realize it. My Aunt Ruth is an alien. Two of my three brothers-in-law are. Most fast-food workers are, as well as some dogs and all cats. It has been scientifically proven that people who disagree with this view are stupid. Print out the alien on this page and tape him to the lining of your jacket. When you suspect someone may be an alien, simply flash the picture where only they can see it, and say quietly, “You’re not fooling me — I know all about you.” Throw in a wink, too, if you’re feeling up to it. Use the following chart to judge whether or not they are extraterrestrial by their response. Check out this sweet Bunny of Exuberance enamel pin. I’ll wait. In all of us resides a little child with an overwhelming sense of wonder and exuberance for life. As we grow older, our hearts, minds, and souls harden and become brittle. Some even mildew. To achieve true Jazz Pickle Awareness, we must remain in touch with the child within us to keep a fresh outlook on life. The bunny, peeking his cute little furry head up from some unexpected place, is that child within you. The child that you used to be: frightened, loving, innocent, immature, hyperactive, unable to control your bladder, unafraid to throw a screaming temper tantrum in public. We must all stay in touch with the bunny inside us. One way to do that is to wear a Bizarro Bunny enamel pin! Print out dozens of copies of the bunny and hide him in unlikely places throughout the day. Whenever someone comes across the bunny and asks about it, encourage them to abandon self-consciousness and act childishly along with you. A good place to begin is by romping naked in a public fountain. Yep, we made the Eyeball of Observation into an enamel pin too. The eye is the symbol of eternal watchfulness. In each cartoon, the eye is watching the action in the cartoon, and it is watching you read the cartoon. It also watches you watching it watch you and the cartoon. When you watch the eye watching you watch it, you are both the watcher and the watched. As you watch the computer screen describing this to you at this very moment, the eye is watching you watch it watching the screen. Together, you and the eye can watch the word “watch” become a strange and meaningless sound through repetition. Watch. Wotch. Woch. Wodge. Wha-ching. Wah-jing. Say this word aloud over and over and contemplate the meaninglessness of the sound and of the world we have created. Draw an iris and pupil on a white pingpong ball and carry it with you always. Place it on tables, countertops, or floors whenever you interact with people. It will assist you in observing and perceiving your surroundings. Do not explain to anyone why you are doing this, including the police. Watch what happens. You guessed it—here’s the Inverted Bird enamel pin. Birds are creatures of great visual beauty, intelligence, and enchanting musical abilities (except for chickens). They are creatures that can both walk in the dirt with the lowliest of worms or soar through the heavens, high above the muck and din of modern life. The Bizarro bird is represented upside-down to show the importance of individuality. The person on the road to greater self-awareness does not march with the rest of the band, neatly in formation, wearing identical costumes, playing the same notes at the same time. Rather, the truly aware Jazz Pickle marches to their own drum, wears their own costume, and moves against the tide of other players, undaunted by the occasional trombone slide to the jaw or bass-drum mallet to the midsection. If that doesn’t appeal to you, you can just say that it means I’m “flipping the bird” at you. Tie a funny hat to your head and hang upside-down out of the window of your home or office. Shout, “I can fly high above the muck and din of modern life. I am a Bizarro bird!” Learn to draw the Bizarro bird and use it in place of your signature for the rest of your life. Especially on government documents. You should snag this Pie of Opportunity enamel pin while you’re at it. Opportunity is like a piece of pie underfoot. We must watch for it, for if we do not see it we may step in it and get sticky fruit and crust between our toes. If we search for it wisely, however, open to the possibility that it may be hiding anywhere, we may enjoy the delicious sweetness. But we must not jump hastily at found pie; what at first looks like a scrumptious dessert on the floor may actually be something the cat coughed up. Buy a pie and place a piece of it in the middle of the floor in your home or office. Once placed, do not move it, and opportunity will knock within 21 days. When the opportunity presents itself, eat the pie and share it with the person who brought the opportunity. Do not take “no” for an answer; both of you must finish the pie together or the opportunity will slip away. “O2” stands for Olive Oyl, who was and shall always be the love of Popeye’s life. (Both “O2” and Olive Oyl’s image count as secret symbols.) Finding the love of your life — one whom you can truly trust — can be an arduous journey and, like most people, I’ve made many missteps. You can be sure you’ve not found the one when you catch them in an important lie like who they got naked with while you thought they were out shopping, or how much money they procured illegally and hid in a secret bank account. You know you have found the one when they treat you with love and respect, even in the tough times and especially in the tough times. My Olive Oyl is the kind of quality partner Popeye could trust not to steal his spinach or come home with a hickey from Bluto. When choosing a life partner, do not, under any circumstances, marry them before you have been in a committed relationship with them for more than two years. In that time, if they lie to you about anything bigger than whether it was they or the dog who farted, cross them off the list and start again. Remember that infatuation is not love, and that love is a choice, not a feeling. It is also important to not mind the way they smell when they’ve not showered, because most of life happens between showers. In life, all of us understand what it is to be lost — literally lost in the lingerie department of a store, or figuratively lost not knowing which way to turn in life, which job to take, which country’s customs officials are easiest to sneak past with recreational drugs. 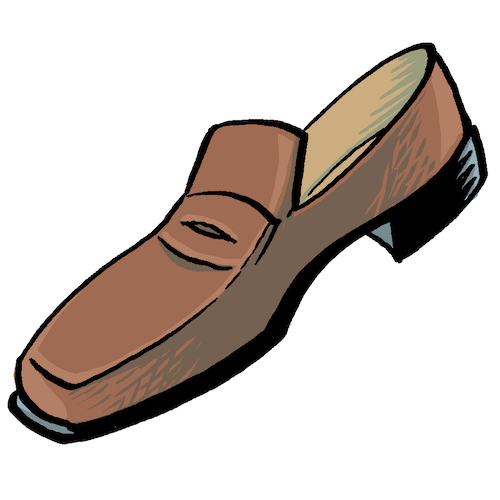 The lost loafer exists in recognition of that feeling we all have at some time in all our lives: useless, outcast, purposeless, smelly, without a mate. The next time you are driving and you see a single shoe in the street, pick it up and carry it with you proudly while keeping an eye out for its mate. Feed it, bathe it, give it a name, introduce it to people you meet as if it were a cherished old friend. The next time you are lost, someone will do the same for you. In some Bizarro cartoons there appears a character with an arrow in his or her back. 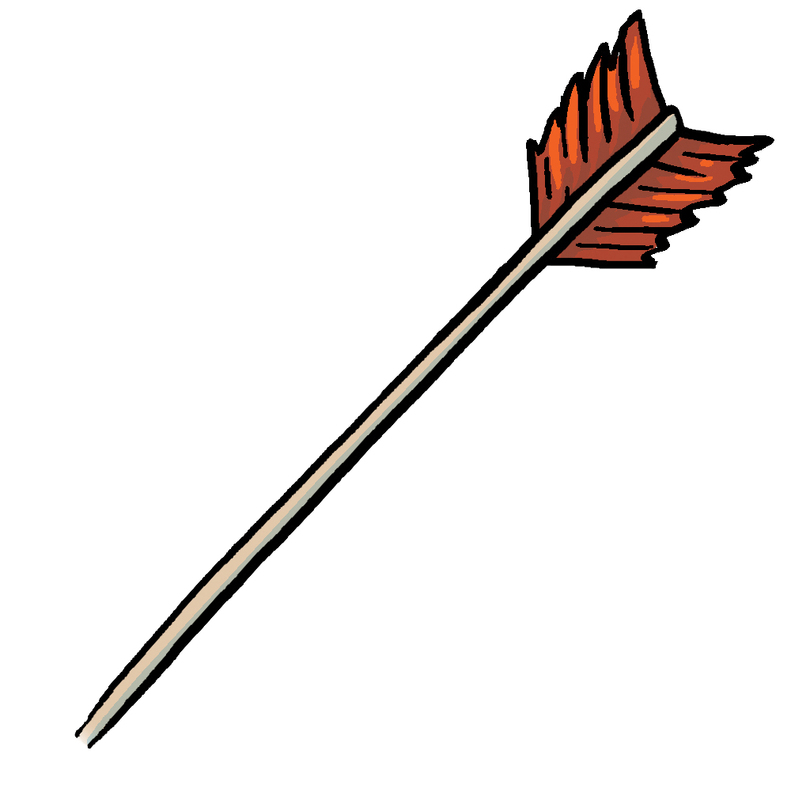 This arrow is to remind us all of our vulnerability. No matter how strong we are (or think we are) we all have blind spots that can be attacked and conquered by those who are out of our view. This is one of the many things that connect us with each other as humans: We all need each other to watch our backsides. I watch many backsides daily and always feel enriched by it. My mentor, the famous Swedish cartoonist Elmo Malmo, used to say, “Remember, even a loaf of bread has an Achilles’ heel.” It doesn’t make much sense translated literally, but in Swedish it is very powerful. With an indelible marker, draw a large arrow on the back of all your shirts to remind you of your vulnerability. Poke your friends and co-workers in the back with a sharpened pencil to remind them of theirs. K is the 11th letter in the English alphabet. An 11 is drawn with two ones. Eleven plus 2 is 13, a traditionally unlucky number. Eleven minus 2, twice, is 7, a traditionally lucky number. Carry a notepad with you and write down all the connections between the letter K and the number 2 that occur to you each day. Discuss your list at length with everyone you meet. As in many aspects of our existence, the crown carries dual meanings: good and evil, positive and negative, yin and yang, Fred and Barney. Though the crown is a symbol of power, authority, and wealth, mayhem can also come from wearing the crown. And hat hair is virtually unavoidable, so bring a comb. If you are willing to accept these risks and responsibilities, make a crown out of cardboard and wear it everywhere you go for 10 days to bring you authority, wealth, and power. While you do so you will be invulnerable, and your decisions will be absolute and incontrovertible. Deal swiftly and harshly with any who criticize or question your authority. Fish are magical because they can breathe water. Can you or anyone you know breathe water? That’s my point. And yet, fish are humble. One never hears a fish boast about anything, including its amazing ability to breathe water. I know that I would definitely be bragging a lot if I could breathe water. The Jazz Pickle seeking true awareness must emulate the fish in its humility (but not in its breathing habits). Any time you pass a body of water that may have a fish in it, drop to your knees in supplication and cry out to the fish to teach you the way of the finned. Do this the rest of your life, wherever you go, and you will find it very humbling. You’ll be the most popular kid on the block with the Dynamite enamel pin. But humans are not electric, so we need to be blasted out of our blathering stupors and soul-numbing routines from time to time. The next time something in your life blows up and you’re looking at a whole new landscape overnight, remember that you have been given a great opportunity to grow. If you’re really super, super upset and are not able to be thankful, maybe try wearing the Bizarro Dynamite of Boom enamel pin! Find some long, red sticks with string hanging out of one end that look just like sticks of dynamite (but not real dynamite) and strap them to the front of a hunting vest you are wearing. Walk leisurely through the streets of your local town and casually ask people if they have a light. If they ask what for, tell them you’re looking for a change. This activity is certain to bring major change to your life within just a few minutes, and maybe even a new address for a few days, months, or years.